Your eyeballs won’t know where to look first. It’s not every day that the Internet’s commenters can all decide together which product on Amazon is most in need of derision by way of product reviews. 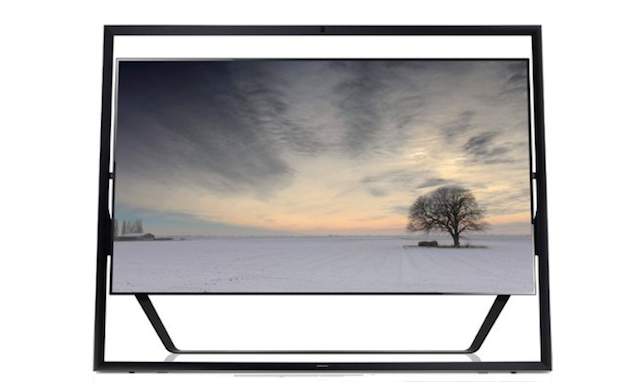 This time it’s not a gallon of whole milk or even a gigantic tub of lube, but a $40,000, 85-inch LED TV from Samsung. It’s on sale, too, down from $44,999.99! Working themselves into a hilarious lather are a slew of reviewers on the product’s page, most of which are 5-stars. Because how could a TV that expensive ever rate lower than that? My wife and I bought this after selling our daughter Amanda into white slavery. We actually got a refurbished. It’s missing the remote, but oh well– for $10K off, I can afford a universal, right? The picture is amazing. I’ve never seen the world with such clarity. Amanda, if you’re reading this, hang in there, honey! We’ll see you in a year. At first I hesitated to make the purchase, but then I saw the two AA batteries were free with the remote, and I was all in! Having this really fills in that empty space we called a bathroom! It fits perfectly into the arms of the T-Rex fossil I just brought home from China. It’s like YOU KNEW, Samsung. Thank you. I am coming back from the future to write this review, and to let everyone know you can buy this TV for $699 in 2015. It still looks great though. So much better than the crappy 84″ we used to have. I enjoy watching old sitcoms, but at this size you can really tell that the dad on Family Ties was wearing a fake beard.